Oceanic shades of green and blue are high on my hit list this summer. Basically if it looks like I could swim in it then I want to be wearing it on my eyes, body or nails, and this combo is pretty close to making all my dreams come true. I've featured LVX before - they release a small edit of fashion led shades each season and for SS13, Veridian is definitely the standout. This gorgeous seagreen is a stunner in its own right and, like all polishes from this brand, is '5 free' - meaning it's free from scary chemicals like Formaldehyde, Formaldehyde Resin, DBP, Toluene, and Camphor. You'll find it on cloudtenbeauty for €12.99. It was the perfect base colour for my current favourite from the (excellent) Sally Hansen Complete Salon Manicure line. 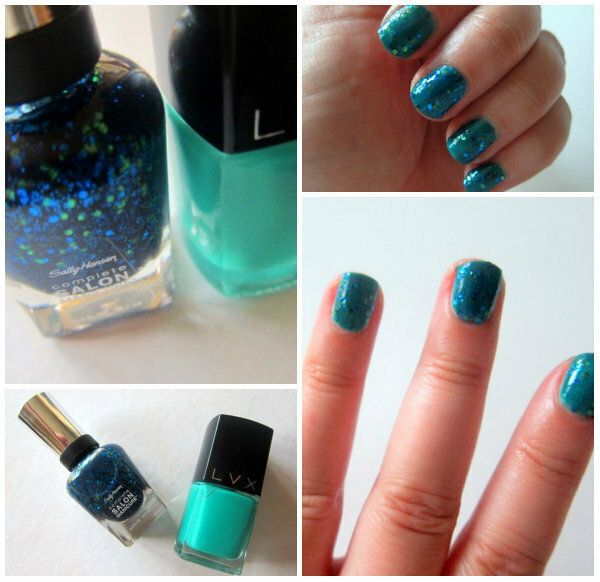 Mermaid's Tale (€8.99) has already made an appearance on the blog but today you get to see on the nails, in all of its sultry and shimmering finery. Isn't it dreamy? Sally Hansen Shore-ly. I had a bit of luck with a fluffy make-you-happy-fairy sending it to me! I have (pretty much) this exact colour on my toes now... makes me want to top it off with something sparkly! Love the finished look Emma! Is the Sally Hansen glitter difficult to remove? Not a nail polish person but I would totally wear my nails like that! I have Barry M Pink Flamingo... It was one of my favourites last summer but I'm not sure this year! Cute, I love the glitter on top! I am wearing a Boujour 1 second nail polish right now. I think it's called red poppy something. It's an orangey red. love the colors! great manicure! Beautiful colour! I'm wearing rimmel double decker red atm I think and I'm unimpressed :( chips.... not of the eating variety either! ok, i loved the blue! when you added the sparkle it shot it to fabulous! hahaha great job emma! I have a similar color on my toes. It's fun for Summer!! I love the mermaid effect but the first coat is cute too! Like by day and by night? Absolutely gorgeous, I love that Sally Hansen polish too - it's an almost bang on dupe for Essence Blue Addicted that was discontinued for some unknown ridiculous reason. Love it! Love it! Love the background color and the idea of putting glitters on top. I find it classy and elegant. So pretty Emma! Love the combo. I haven't worn polish in months now! For some reason, I just can't be bothered, but lately all the summery colours are starting to catch my eye! I'm actually wearing a Sally Hansen Complete Manicure polish too in Gilty Pleasure! They're such an amazing formula! Love these two colours, I gotta get some more Sally Hansen polishes!